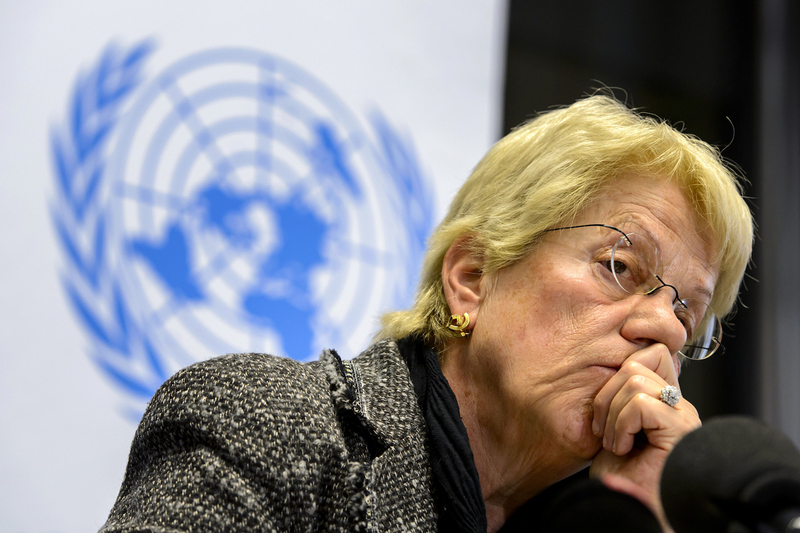 'I Give Up': Top War Crimes Expert Resigns From U.N.'s Syria Inquiry : The Two-Way "The states in the Security Council don't want justice," Carla Del Ponte told the Swiss publication Blick. "I can't any longer be part of this commission which simply doesn't do anything." Carla Del Ponte, a former United Nations prosecutor and member of a U.N.-mandated commission of inquiry on the Syria conflict, at a 2013 press conference in Geneva. A top former war crimes prosecutor has quit the U.N.'s Independent Commission of Inquiry on Syria, over what she described as the Security Council's lack of political will to hold the perpetrators of war crimes accountable. "I give up. The states in the Security Council don't want justice," Carla Del Ponte said in comments to the Swiss publication Blick, as quoted by The Associated Press. "I can't any longer be part of this commission which simply doesn't do anything." Del Ponte, 70, gained international prominence during her time as a war crimes prosecutor in tribunals on Rwanda and Yugoslavia. She has previously called for an international tribunal for Syria, or as the BBC reports, for referring the matter to the International Criminal Court. "Although the United Nations is setting up a new body to prepare prosecutions, there is no sign of any court being established to try war crimes committed in the six-and-a-half year-old war, nor of any intention by the U.N. Security Council to refer the situation to the International Criminal Court in the Hague," Reuters reports. The U.N. commission was established in 2011, with a mandate to investigate potential human rights violations by all participants in the war in Syria. Del Ponte joined as a commissioner in 2012, and she has been working with Paulo Sergio Pinheiro of Brazil and Karen Koning AbuZayd of the U.S.
"We have had absolutely no success," she told Blick, the AP writes. "For five years we've been running up against walls." She added: "Believe me, the terrible crimes committed in Syria I neither saw in Rwanda nor ex-Yugoslavia. We thought the international community had learned from Rwanda. But no, it learned nothing." Over the course of numerous reports, the commission has documented what it says are serious crimes by the government and by nonstate armed groups. The commission said in a statement that Del Ponte told them in June that she planned to resign. "It is our obligation to persist in its work on behalf of the countless number of Syrian victims of the worst human rights violations and international crimes known to humanity," it added. "Such efforts are needed now more than ever." The commission wished Del Ponte well and described her as a "tireless advocate for the cause of accountability and bringing perpetrators of war crimes and crimes against humanity to justice."